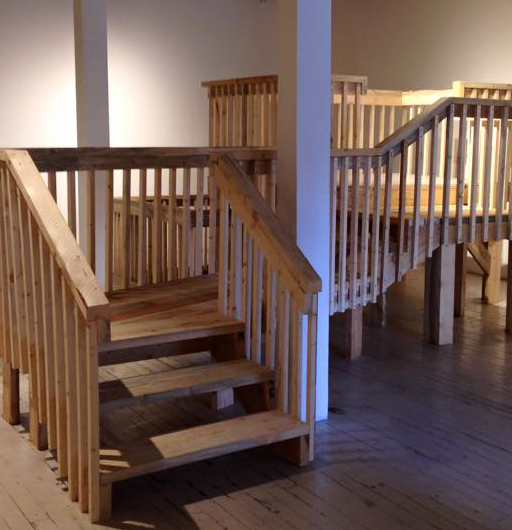 Platform for Viewing, a new site-specific sculpture by Adam Bateman will being featured in the Boulder Museum of Contemporary Art's exciting new exhibition Substrate opening Thursday, January 29th, 2015 and running through April 5, 2015. As one of seven talented artists in the show, Bateman has been invited to create an intervention with the museum's floor drawing attention towards the most interactive and often overlooked surface in an art space. With his piece Platform for Viewing Bateman continues his interest in the cross-section of Modernism and the mitigated West. Excised sections of BMoCA's weathered floor elevated with raw lumber form a series of connected platforms. Museum viewers can traverse this walkway reminiscent of those found in National Parks — institutionalized wildernesses where eco-tourists are directed safely through the natural landscape to predetermined, optimal site-seeing locations. Here however, eyes are turned towards the indoor architectural environment. Like park service platforms, the sculpture controls the viewer's movement through space while also offering up a completely new vantage point. except now it is of the institution itself. Looking over the banister one peers down into the hole of the raised flooring revealing the physical underbelly of a contemporary museum fittingly located in the heart of the American West.